For one reason or another, Wedge Holdings, the Japanese publisher of Rockman Megamix and Gigamix in Japan, are planning to reprint Shigeto Ikehara’s Rockman 7 manga in Japan. 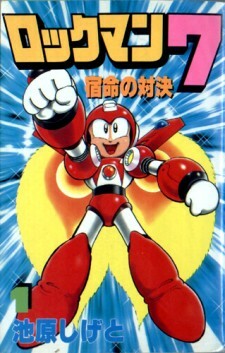 Ikehara's comic adaption of Rockman 7 was originally published in three volumes from 1995 to 1996 under the now-fedunct Comic BomBom label. Come February 2011, the books will be reprinted for 1,260 Yen or roughly $15.31 US. It remains to be seen if the reprint is a single volume compilation or three individual books. Notably, the original volumes retailed for 400 yen; the current 1,260 Yen price tag suggests that we're looking at a compilation. It'd be great if this is the start of a whole slew of Ikehara reprints -- that way, Udon might even consider bringing 'em stateside! If you've got the means to do so, pre-order your copy here.